Problem: Mike loves “Chinese” takeout. My stomach can;t handle the grease. Solution: make it at home. I made it this time with a lightly battered fried chicken, but I think next time I’ll skip the frying all together. It will 1) save time and 2) be just a tad bit healthier. Using low sodium chicken broth is absolutely essential. The sauce will be horribly salty if you don’t!! In a medium bowl, combine sesame oil, egg white, 1 tablespoon soy sauce, and 1/4 cup plus 2 tablespoons corn starch. Add chicken, stirring to coat. Let stand at room temperature for 20 minutes. Meanwhile, in a small bowl, combine chicken broth with chile-garlic sauce, sugar, and 1/4 cup soy sauce and 1 tablespoon cornstarch. In a large, deep skillet, heat 1/2 inch of oil until shimmering. Carefully add the chicken, one piece at a time and fry over high heat, turning once or twice, until brown and crisp, about 4 minutes. Remove cooked chicken to paper towels to drain and immediately add to the sauce with the scallions. Cook until just coated, about 30 seconds. Categories: Chicken, Dairy Free, Gluten Free, Main Entrees, Meat, Special Diets | Tags: Asian, chicken, main dish, meat | Permalink. General Tsos is one thing that I’ve never even thought about trying at home. Looks simple enough! Gonna have to give this a shot! That looks great. 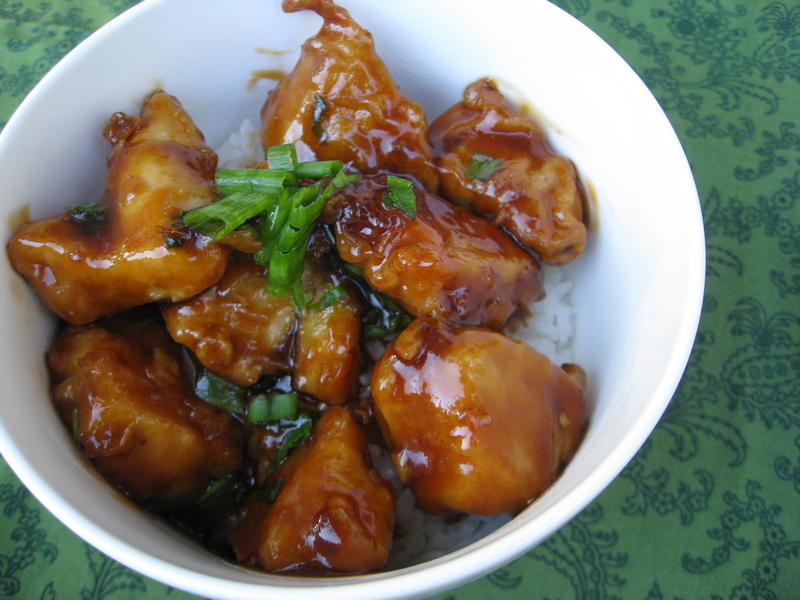 General Tso’s is one of my favorites, so I’m going to definitely look into trying that.